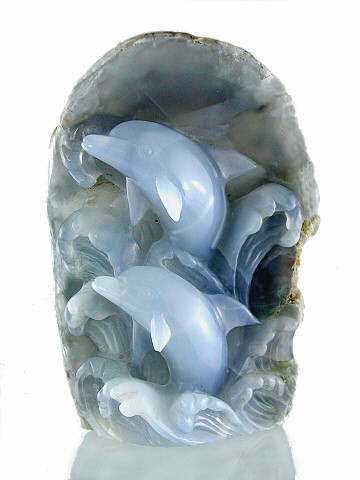 The most truly exquisite Blue Chalcedony carving of a pair of Dolphins playing in the surf. This carving has a beautiful feel to it and the quality of the workmanship is superb. It is carved out of one solid piece of Blue Chalcedony and the details in the waves makes them appear as though they were actually real. One of the most special things with this gorgeous pair of dolphins, is that the carver has left some of the maxtix (albeit polished) at the back of the carving - revealing to us the inner beauty contained within something so seemingly plain and ordinary. A very special spiritual lesson indeed; this is a captivating piece. Chalcedony is a fibrous, cryptocrystalline (microscopic crystal) variety of Quartz. It comes in many colours but the blue in particular has a very peaceful, spiritual, calming energy. It is an excellent cleanser, absorbing negative energy, transmuting it so that becomes harmless (especially where anger is present). It is a very cleansing stone, said to promote healing of sores and is also very protective, making it an ideal crystal to have in your environment.